With an active working width of 1 metre, you can establish new lawns or overseed existing areas of up to 1000 m² in one hour with the ELIET GZC. Thanks to its small dimensions and agility, this machine is also suitable for setting up smaller lawns. As the overseeder is driven both on its front and back rollers, it must be the only machine that can be used both on hills and undulating lawns. The operator can enjoy the incredible comfort of a proportionally adjustable hydrostat. Declutching is unnecessary: he can smoothly adjust the speed at any moment. Here ELIET purposefully chose a dual hydrostatic transmission by which the hydraulic motor in each roller enjoys the luxury of having a separate pump. As a result, each hydraulic motor can also be controlled separately and proportionally. The control of the rollers is coupled to a movable handlebar. When the handlebars are turned to the left, this movement is translated into a difference in traction between the left and right front rollers that turns the machine to the right. The farther the handlebars are turned away, the greater the speed difference between left and right rollers and the sharper the bend. Arising from a natural action, this makes the steering quite intuitive, giving the operator the control to sow even in the smallest corners. This makes the new ELIET Lawnseeder ideal for the construction of private gardens with limited access and complicated shapes. The hopper has a capacity of 61 litres /13 gallons (GZC 750) or 93 litres / 20 gallons (GZC 1000). The seeding rate can be adjusted from 0 to 100 g/m2 (0 to 4 ounces / square feet). A carousel in the seed tray ensures a continuous and steady flow of grass seed. The seed tray has the same width as the harrow. As the seed funnels on the harrow are positioned at the front, the seed is scattered on the soil across the full width. That way you will not be faced with unsightly seed lines. The hopper is a separate part that is hung onto the machine. This means that when carrying out preparatory levelling work, one can easily remove the hopper from the machine to gain a better view of the harrow. It also avoids damage to the seeding equipment by stones that may be thrown up while levelling. There is a second higher and safer hanging position for those who prefer to leave the hopper on the machine. For creating a new lawn, the major seed manufacturers for ornamental and sports lawns recommend a seed flow rate between 20 gr and 30 gr/m2 (0,8 ounces and 1,2 ounces /square feet). Most seed mixtures contain the three most common seeds: English rye-grass, common meadow grass and red fescua. Obviously, the size of the seeds differs, and therefore the speed of discharge through the openings of the seed hopper will vary depending on the composition of the mixture. Thanks to the continuous improvement programmes of the varieties, the seeds keep evolving. The recent innovations in terms of growth stimulating coatings on the grass seeds also create a situation where mixtures that are recommended today will be outdated in a few years. Therefore, it is important for a sowing machine to have a seed flow rate control that can easily cope with this fast evolution. That is why ELIET has a fine adjustment control on its sowing machine which allows for 36 settings. The broad scale allows the seed openings to be set with great precision. Whilst preparing the seedbed, the vibrating harrow frequently digs up stones from the subsoil. A larger stone may accidentally become stuck between the vibrating harrow and the rear roller. To avoid that this jam causes the drive to break, it is protected by means of a slip coupling. The ELIET lawnseeder has two crusher rollers in front and a machinewide one at the rear. This provides a good weight spread and evenly flattened soil overall. As the rollers have an open profile, the soil surface is not compacted as they roll over it. The soil is thus left loose enough for water and nutrients to filter through. Erosion is prevented even after heavy rain. It is essential that the machine’s own weight be substantial in order for the machine to function properly. The weight-adding measures taken by ELIET greatly benefit the user as they turn the GZC into an indestructible armour. With plate thicknesses ranging from 5 to 20 mm (0,2 to 0,8 inches), it goes without saying that operational safety is guaranteed. The structure of the machine remains, before anything else, simple and maintenance-friendly. 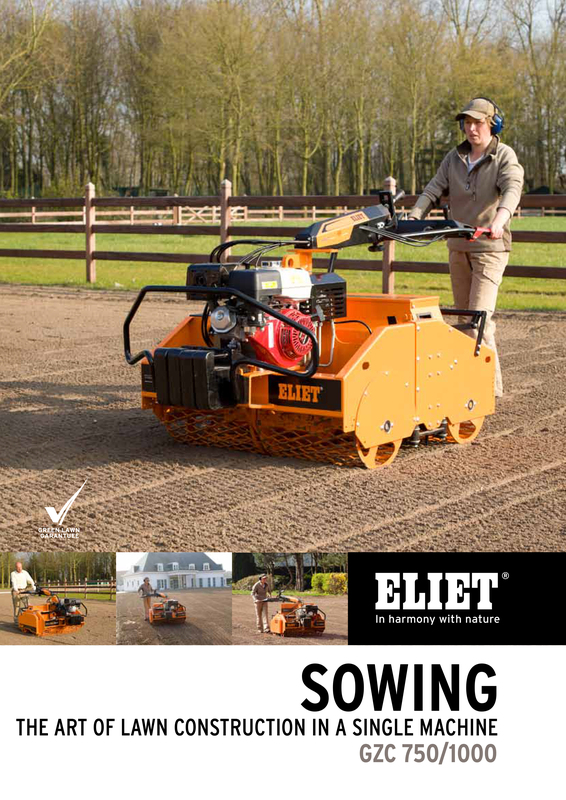 To guarantee a perfect lawn finish when sowing new grass seeds, without leaving any footprints in the sand, ELIET added a simple, smart feature: a sideways adjustable handlebar. The operator can at any time adjust the handlebar sideways and steer it at an angle of 20° to the left or right. The sideways adjustable handlebar allows the operator to walk alongside the machine and still make full use of the Intuitive Steering feature. To remove the seed reservoir, you can even swing the handlebar 90° to the left. One of the most important controls of the machine is the lever to set the depth of the harrow action. The operator can continuously adjust the harrow’s depth setting to thoroughly till the soil and to lay out a seedbed with the correct granularity. The lever is within easy reach of the operator to enable smooth switching between the 6 depth positions. Freight traffic legislation is becoming more and more stringent. For example, some EU Member States require that a machine be fitted with at least 4 anchor points to guarantee safe transport. In accordance with these regulations, the ELIET GZC is fitted with such an attachment point in each of the chassis’ corners. In addition, there is an eye at the centre of the machine which allows the machine to be lifted with a crane. The vibrating harrow consists of two rows of teeth that penetrate the ground to a maximum depth of 7 cm (2,7 inch). It is one of the most important parts of the machine as it accounts for three critical operations: fine tillage of the top layer, ground levelling, sowing and covering the seed. The drive of the vibrating harrow can be switched off which is important for safe transport to and from the workplace and for loading and unloading. The handlebars of the GZC are laterally movable. By pushing the handlebars sideways, a simple yet ingenious mechanism translates this movement into steering the hydrostatic drive of the front rollers that allows the machine to turn in the direction with the momentum that the operator had envisaged when applying his steering action. The steering can be operated lightly but does give a certain counterpressure so that it really feels like you are turning a machine with a weight exceeding 400 kg (884 pounds).